Carol Morgan with Denim Marketing and Paul Cardis of Avid Ratings present Online Reputation Management: Give Them Something to Talk About. This seminar offers ways that companies can proactively work on reputation management while also giving some suggestions of what not to do. The majority of people trust online reviews and endorsements from friends when making purchasing decisions. In fact, they turn to the Internet for recommendations and confirmation before approaching the market. Consumer access to reviews can either benefit or damage a company’s sales. Managing your reputation online is critical. Learn how to harness the power of positive reviews and testimonials while reaping the benefits of crafting a solid online reputation. Online reviews impact 67.7% of purchasing decisions. These statistics are from Forbes.com’s Online Reputation Statistics that Every Business Owner Needs to Know. Get out in front of bad reviews. Be proactive in getting reviews and testimonials. Are you proactive or reactive? Do a quick audit and be honest with yourself about your company. Do you need help with online reputation management? Now that you know where your pain is, what is the next step? Will you work to get reviews or testimonials? And, what is the difference anyway? A review is a report in which a person gives their opinion on the quality or performance of a product or service. These are typically on third-party sites. A testimonial is a formal statement of a person or company’s qualifications or character typically written or created after an experience of working with them. 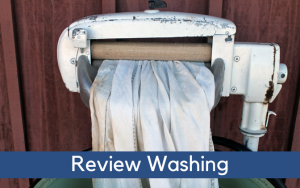 It is important to know the difference because review washing was made illegal by the Federal Trade Commission (FTC) in its Consumer Review Fairness act. This federal law provides rules for survey systems and reviews. It makes it illegal to suppress negative reviews from third-party sites from appearing online. Learn about tools and techniques to monitor, protect and defend your brand. 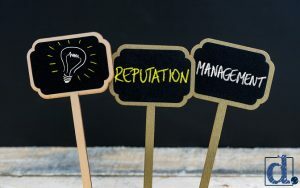 Discover how to proactively manage your company’s reputation through social media. Learn ways to get positive testimonials. To book the Online Reputation Management seminar, call 770-383-3360 x20 or contact carol (at) denimmarketing.com. 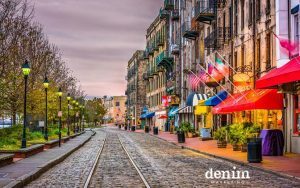 For more information on how Denim Marketing can help your business with online reputation management or other strategic marketing, Contact Us! 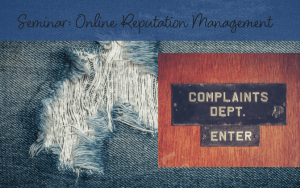 Read our recent article on ironing out your online reputation – here.